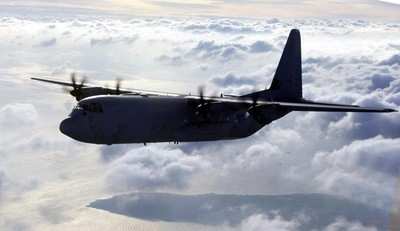 The UK Ministry of Defense (MoD) announced Tuesday the decision to destroy a Royal Air Force (RAF) C-130 Hercules (file photo below) following a landing incident 12 miles north of Al-Amarah in the southern Iraq province of Maysan. According to reports in the UK press, two people -- officials would not confirm they were military members -- suffered minor injuries in the incident and were taken to a hospital. The MoD said although there was no evidence of hostile action, the plane was significantly damaged during the landing incident. After attending the injured, military personnel secured the area allowing the RAF to assess the damage to the aircraft. The plane was destroyed about three hours later after technicians determined the extensive damage prevented flight to an area where repairs could be made. An MoD spokesman told the BBC, "It was concluded that the aircraft could not be recovered without exposing our personnel to undue risk. There was also a potential risk that anti-Iraqi forces might obtain information on specialist equipment. The aircraft was therefore safely destroyed by multinational forces." UK military spokesmen stressed the aircraft was involved in routine re-supply operations, and there was no evidence of enemy action in the incident.